Park View City, a project of Vision Group, has Recently approved NOC from the Capital Development Authority (CDA) to carry out construction work and project marketing, according to a publication. The society has also received direct access from the 200-feet wide Kuri Road. The society management has invited applications from financially stable real estate firms, property dealers, and those linked with the property sector, requesting them to contact the society management as soon as possible. Park view city situated in the heart of Islamabad which is a definition of luxury and serenity. When it comes to finding the perfect family friendly neighborhood a lot of things are to be considered, from schools to hospitals to other facilities that are required. The plots are categories into the following types of cutting. 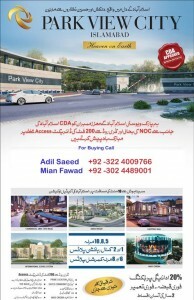 Park View City Islamabad has also launched Luxury apartments in Future. The features range of strategically positioned plots of 5, 8, 10 Marla, 1 Kanal, 2 Kanal and 4 Kanal as well as impeccably crafted homes that speak the architectural prowess of their builders. With the line materials and Unique perspective. Residence at Park View City has become the new paragon of Luxurious living. Lavish modernity, caressed by an alluring natural beauty. The society is soon to initiate the process of sale and purchase of commercial and residential plots. The above is an Offical payment plan of Park View City. 10% extra amount will be charged on each category (Corner / Park facing / Main boulevard) plots. 5% Discount will be given on lump-sum payment. Possession of plots will be within Two years. Post dated cheques against all installments will be taken in advance. 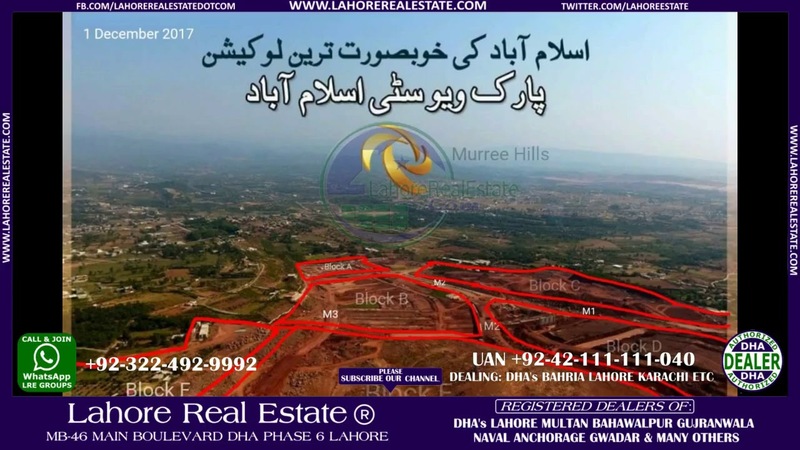 Availability of plots will be on First Come First Serve Basis. The park view city has a unique development plan as can see in the picture or video given below. Thes are the features of the project. MB-46 Main Boulevard DHA Lahore Phase 6.